B’Elanna Torres has never cared for the Day of Honor. 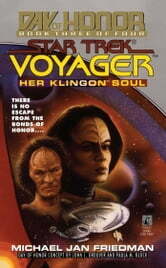 Ashamed of her Klingon heritage, she regards the holiday as an unwanted reminder of all she has struggled to repress. Besides, something awful always seems to happen to her then. Her bad luck seems to be running true to form when she and Harry Kim are captured by alien slavers. Imprisoned by the enigmatic Risatti, forced to mine for deadly radioactive ore, Torres will need all of her strength and cunning to survive—and her honor as well.